My research focuses on user innovation – developing products with a consumer mindset – and digital marketing that makes use of the internet. I have worked on numerous product development projects in companies. Based on this experience, I encourage students to take a hands-on approach to studying the entire process from research and planning to commercialization. 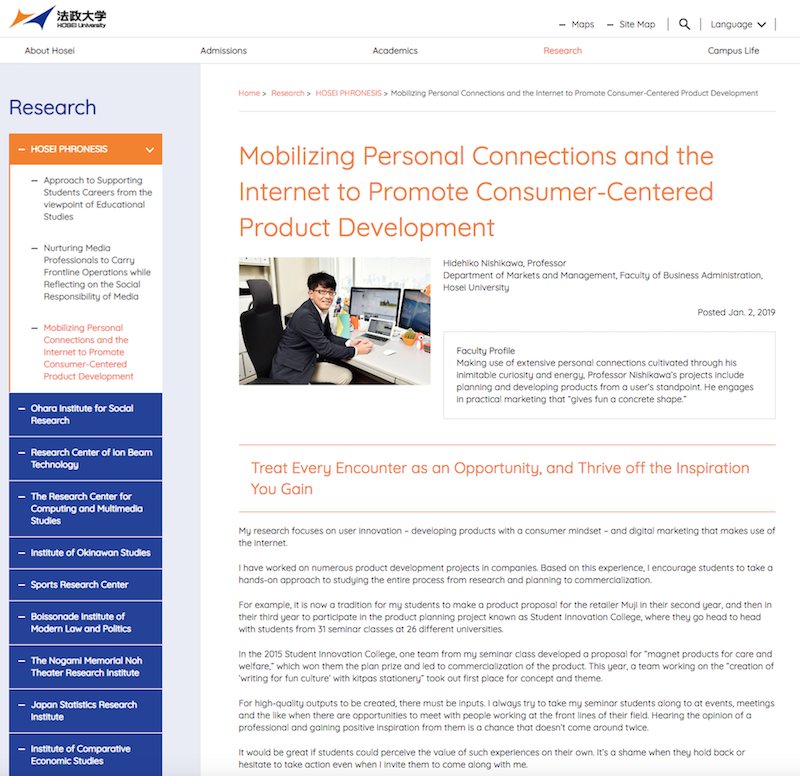 For example, it is now a tradition for my students to make a product proposal for the retailer Muji in their second year, and then in their third year to participate in the product planning project known as Student Innovation College, where they go head to head with students from 31 seminar classes at 26 different universities. In the 2015 Student Innovation College, one team from my seminar class developed a proposal for “magnet products for care and welfare,” which won them the plan prize and led to commercialization of the product. This year, a team working on the “creation of ‘writing for fun culture’ with kitpas stationery” took out first place for concept and theme. For high-quality outputs to be created, there must be inputs. I always try to take my seminar students along to at events, meetings and the like when there are opportunities to meet with people working at the front lines of their field. Hearing the opinion of a professional and gaining positive inspiration from them is a chance that doesn’t come around twice. It would be great if students could perceive the value of such experiences on their own. It’s a shame when they hold back or hesitate to take action even when I invite them to come along with me. When you step out into wider society, you gain an equal footing as a working adult, so you can no longer just meet with people and hear their stories or exchange opinions light-heartedly, let alone gain feedback from them – unless of course you compensate them for their time. I don’t want my students to miss out on the golden opportunities they can enjoy while still students: I hope they will grasp them avidly and thrive off what they learn. In my seminar class we divide roles among four groups, with the students themselves taking the initiative to decide most activities under the guidance of fourth-year student leaders. For example, policies for seminar operation and routine schedule management are determined under the direction of a team of seminar leaders comprising one male and one female student from each year level. An events team is responsible for overseeing seminar events. In the summer intensive workshop, which is always held overseas, students conduct interviews at local companies. I usually introduce them to the places to visit through my own connections, but all the travel arrangements and schedule management tasks are handled by the students themselves. This year we went to Hong Kong and visited three companies: the Hong Kong branch of Muji, a luxury supermarket that sells many imported products, and a Japanese financial institution. My role in the seminar is one of support. I prompt the students to act, providing opportunities for them to connect with wider society and helping them determine which direction to take. The whole experience is more valuable if you think and act for yourself, rather than simply following someone else’s lead. Above all, you enjoy what you’re doing. I want students to manifest their own strengths rather than acting as if they’re just helping someone else out with their research. When you’re a student, your mistakes are redeemable. I expect each student to take the initiative without hesitation, and display an approach that is so pro-active that it almost seems reckless. Branching out from user innovation, recently I’ve been doing research in an area known as “co-creation.” I’m endlessly fascinated by the way you can come up with new ideas, extend your communication and build new relationships by talking things over with others and sharing opinions in a lively and open way. In order to give “fun” a concrete shape and make it into a business, you need insight. This may take the form of predictions of consumer behavior based on marketing theory, or the wisdom and knowledge to interpret market trends from statistical analysis. A university is the ideal place to learn theories that can be applied in practice. Even if you want to go back and study things like research and statistical methods after graduating, most employers won’t give you the opportunity to do so. In the spirit of giving shape to the idea of “practical wisdom” in the Hosei University Charter, I hope that students will put into practice the marketing theories they learn in class, and gain a real sense of how their learning at university can be of use in society. One concept that I cherish and aim to uphold is that of “intellectual curiosity.” Rather than just pursuing the companies and phenomena I find immediately interesting, I try to forget my prejudices and follow up things that acquaintances recommend to me, even if I had no prior interest in them. This often leads to unexpected ideas for research and business. Introductions from acquaintances are more important than personal intuition in leading me to types of information that I never knew about and would never have selected on my own. I believe that this is an effective way of generating new ideas. My antennas of curiosity were hard at work even when I was still employed in the corporate sector. When I found a seminar series that looked interesting, I would explain it to my boss, get permission one way or another, and go off to attend it whenever the time allowed. I would go so often that the instructor remembered my face. We got to know each other, and that led to introductions to others and access to advice when I needed it. I believe that this still has a positive influence on me today. I was fortunate to make so many connections, but when I do company visits with my seminar students today, I almost feel ashamed at the generosity of some creative professionals in offering their opinions and advice to us for no charge. Even students who were daunted to begin with soon become keen to take part in these visits, as they appreciate the value of gaining fresh new ideas from a totally different perspective. One intriguing story I heard during a visit with my seminar students the other day was about an event held as part of a trip for employees of teamLab, a firm that creates outstanding digital art products. It was a simple type of robot contest, where teams of participants each had to make a motorized mechanical device using only the materials provided, then pit their devices against one another. I’m sure that my students were inspired by this example of a fun activity in which challenges are solved by giving free rein to the power of ideas and teamwork. The students immediately came up with their own idea for a new type of robot contest, and are preparing to implement it during our spring seminar retreat. Opportunities to interact freely with other users have expanded hugely with the rise of the internet. Diverse information held by each user is brought together, ideas are generated, and new forms of innovation are born. This is precisely what my research on user innovation and co-creation is all about. The key is to combine different types of information. Why I value intellectual curiosity so much is probably because I know from experience that in order to generate innovative ideas, even within one’s own mind, it’s essential to bring together new and different types of information. I intend to continue using my intellectual curiosity to seek out such information. Born in Hyogo Prefecture in 1962. Graduated from the Department of Electrical Engineering, Faculty of Engineering at Doshisha University. Completed the doctoral program in the Department of Market Science, Graduate School of Business Administration at Kobe University and earned a Ph.D in Commerce. Worked in areas including corporate planning at World Co., Ltd., and was a Director of Muji.net Co,. Ltd. before joining the Ritsumeikan University College of Business Administration as an Assistant Professor, then Associate Professor, then Professor. Appointed in 2010 as a Professor of the Faculty of Business Administration and Graduate School of Business Administration at Hosei University, a position which he continues to hold to the present day, as well as being an Executive Director of the Japan Marketing Academy.